It is important that kids pick up hygiene habits at early age. 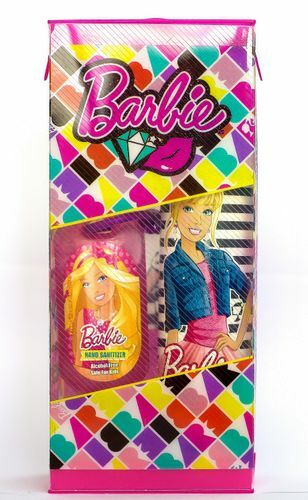 Help your kids to stay clean and fresh with Barbie Gift Pack. It contains a deodorant and a hand gel sanitiser. Filled inside a fashionable bottle deodorant emits pleasant fragrance. Magical aroma freshens up the mood and gives refreshed feeling. Formulated without alcohol it is completely kids friendly. A hand gel sanitiser is the best way to keep your kid clean. Soft, silk gel cleans hand thoroughly and keeps germs, bacteria at bay. Leaves hands with a cool feeling and a fresh, sweet scent. Additional Information: The very first Barbie doll was introduced in 1959 in the USA, by Ruth Handler under Mattel Inc. Till date they continue to grow with their Barbie range of products made for children. Surprise your kid with Barbie Gift Pack, an awesome yet useful for every kid! Explore the entire range of Miscellaneous available on Nykaa. Shop more Barbie products here.You can browse through the complete world of Barbie Miscellaneous .